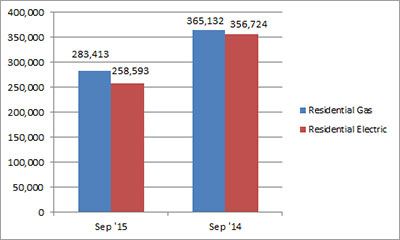 U.S. shipments of residential gas storage water heaters for September 2015 decreased 22.4 percent to 283,413 units, down from 365,132 units shipped in September 2014. 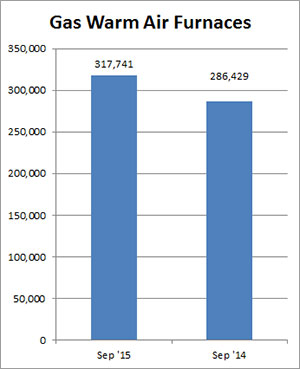 Residential electric storage water heater shipments decreased 27.5 percent in September 2015 to 258,593 units, down from 356,724 units shipped in September 2014. For the year-to-date, U.S. shipments of residential gas storage water heaters increased 3.3 percent to 3,388,734, compared to 3,279,008 units shipped during the same period in 2014. Residential electric storage water heater shipments decreased 0.2 percent year-to-date to 3,124,296 units, compared to 3,130,659 units shipped during the same period in 2014. Commercial gas storage water heater shipments decreased 5.4 percent in September 2015 to 7,315 units, down from 7,729 units shipped in September 2014. Commercial electric storage water heater shipments increased 25.6 percent in September 2015 to 7,609 units, up from 6,060 units shipped in September 2014. Year-to-date U.S. shipments of commercial gas storage water heaters increased 3.9 percent to 74,162 units, compared with 71,375 units shipped during the same period in 2014. Year-to-date commercial electric storage water heater shipments increased 16.3 percent to 64,513 units, up from 55,478 units shipped during the same period in 2014. 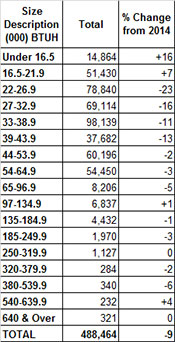 U.S. shipments of gas warm air furnaces for September 2015 increased 10.9 percent to 317,741 units, up from 286,429 units shipped in September 2014. 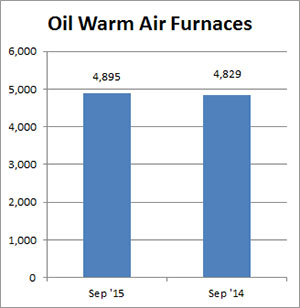 Oil warm air furnace shipments increased 1.4 percent to 4,895 units in September 2015, up from 4,829 units shipped in September 2014. Year-to-date U.S. shipments of gas warm air furnaces increased 5.8 percent to 2,029,999 units, compared with 1,918,179 units shipped during the same period in 2014. Year-to-date U.S. shipments of oil warm air furnaces increased 9.7 percent to 23,996, compared with 21,879 units shipped during the same period in 2014. 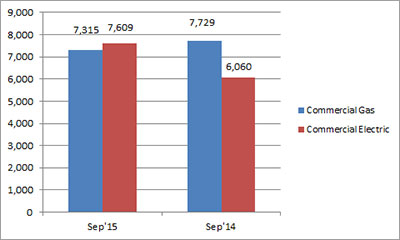 U.S. shipments of central air conditioners and air-source heat pumps totaled 488,464 units in September 2015, down 9.5 percent from 539,628 units shipped in September 2014. U.S. shipments of air conditioners decreased 3.5 percent to 335,867 units, down from 348,143 units shipped in September 2014. U.S. shipments of air-source heat pumps decreased 20.3 percent to 152,597 units, down from 191,485 units shipped in September 2014. 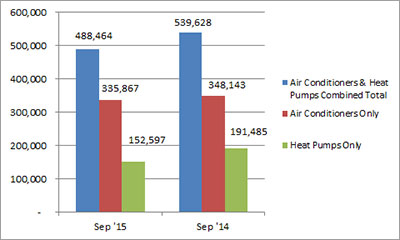 Year-to-date combined shipments of central air conditioners and air-source heat pumps increased 1.8 percent, to 5,700,792 units, up from 5,599,693 units shipped in September 2014. Year-to-date shipments of central air conditioners increased 3.0 percent to 3,824,980 units, up from 3,713,244 units shipped during the same period in 2014. The year-to-date total for heat pump shipments decreased 0.6 percent to 1,875,812 units, down from 1,886,449 units shipped during the same period in 2014.